Colonel Henry Steel Olcott (1832-1907), founder and first president of the Theosophical Society, is well-known as the first prominent person of Western descent to make a formal conversion to Buddhism. His subsequent actions as president of the Theosophical Society helped Buddhism into a new renaissance. He is still honored in Sri Lanka for these efforts. Self-educated, his scholarship of Buddhism made a significant contribution to the development of Buddhist studies. He founded schools, the Young Men’s Buddhist Association and championed civil rights in Sri Lanka. His systematic presentation of Buddhist teachings also did much to promote what has been described as "Protestant Buddhism" in the West. 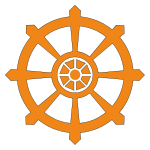 His "Buddhist flag" is widely used by Buddhist institutions and organizations. An early supported of Indian independence, he encouraged the use of home made products instead of imported goods. He successfully lobbied for recognition of the Buddha's Birthday as a public holiday in colonial Sri Lanka. Known as the "White Buddhist," his death is commemorated annually in Sri Lanka on February 17, when he is remembered his contribution to Sri Lankan Buddhism and also to the creation of the modern nation state. Olcott grew up on his father's New Jersey farm. Olcott later published a genealogy of his family that traced him back to Thomas Olcott, one of the founders of Hartford, Connecticut in 1636. In his teens he attended the College of the City of New York and Columbia University,[] where he joined the Saint Anthony Hall fraternity,[] a milieu of the socially prominent, until his father's business failed in 1851. In 1860 he married Mary Epplee Morgan daughter of the rector of Trinity parish, New Rochelle; they had three sons. They divorced in 1874. He taught himself agriculture, earning a reputation in the field of agricultural education by establishing a school farm and lecturing on agriculture at Yale University and elsewhere. Olcott was agricultural editor of the New York Tribune (1858–1860), and sometimes submitted newspaper articles on various other subjects. He became interested in the paranormal at this time and engaged in some research into the occult. When the Civil War began he joined the army, serving initially as a special commissioner investigating allegations of fraud in the New York Disbursement Office. Having achieved the rank of Colonel, he was seconded to the U.S. War and Navy departments in Washington, DC (1863–1866). He was commended for his work by the Secretary of the Navy. Following Abraham Lincoln's assassination, he was a member of the team that investigated the President's murder. In 1865, he resigned his commission and returned to New York where he studied for, and became a member of, the bar. Specializing in customs and excise and insurance cases, he became a recognized expert in this area of law. While continuing to practice law in New York, Olcott's interest in the occult was revived by reports of events at the Eddy Farmstead in Vermont, where some type of spiritual phenomena where occurring involving séances. He managed to obtain an assignment from various newspapers to investigate these occurrences, publishing a series of articles that attracted wide popular interest. These articles were syndicated and he returned to the Farmstead to write additional articles. During this period, he first met Helena Blavatsky when they were both visiting the Eddy farm. The extremely charismatic Russian-born Blavatsky was an occultist who claimed to be in communication with spiritual Masters in the East. This began what would develop into a long working relationship. In early 1875, Olcott was called upon by prominent Spiritualists to investigate the charge of fraud against the mediums Jenny and Nelson Holmes, who had claimed to materialize the famous spirit control]] Katie King (Doyle 1926: volume 1, 269-277). In September of 1875, Henry, Helena and others, notably William Quan Judge formed the Theosophical Society. Olcott became President, Blavatsky its Corresponding Secretary. Olcott saw his role as mainly organizational but also as controlling Blavatsky, whose enthusiasm sometimes needed to be kept in check. While still practicing law, Olcott assisted Blavatsky with her Isis Unveiled (1877) . Accusations of dishonesty against Blavatsky resulted in an investigation. Although she was exonerated, Olcott became increasingly uncomfortable with her moods and temper, even though he continued to work with her. The United States did not appear to be fertile ground for their ideas, so in December 1878 they relocated to India, eventually establishing their headquarters of the Society at Adyar near Madras. They landed at Bombay February 16, 1879.From Adyar, Olcott edited the society's journal, The Theosophist. The articles included anti-missionary propaganda, information on Eastern religions, free thought and matters related to the occult, a somewhat eclectic mix. Their aim was to unite humanity around the ideal of universal brotherhood and sisterhood across racial, religious and other barriers. In 1880, Olcott traveled to Sri Lanka for the first time, where he formally converted to Buddhism, although he maintained that true Buddhism was identical with the wisdom of the ages and especially with that contained in the Upanishads. Due partly to their strained relationship but also ill health, Blavatsky resigned as Corresponding Secretary in March 1885 and returned to Europe. you should endeavor to do for Buddhism what the more enlightened students of Christianity have long been doing … you should free your religion from its later excrescences, and bring it back to its earliest, simplest and purest form as taught by Buddha and his immediate disciples . Olcott founded schools, most notably Ananda College, Nalanda College, Dharmaraja College and Visakha Vidyalaya. He also established the Young Men's Buddhist Association, modeled on the Young Men's Christian Association, lobbied for recognition of the Buddha's birthday as a national holiday and acted as adviser to a committee appointed to design a Buddhist flag. He was tireless in his efforts to promote a form of what became known as "Protestant Buddhism" that stripped Buddhist practice of what he saw as superstition in favor of a type of philosophical abstraction from the earliest sources. To aid this process, Olcott wrote his Buddhist Catechism (1881), which presented what "all Buddhists in the world should be able to subscribe to." This publication, endorsed by a senior Buddhist scholar, was widely distributed and translated into numerous languages. This approach to the Buddha's teaching became the dominant approach, although Olcott almost certainly pioneered its use. The Buddha used many lists, including these but would also sometimes give different answers to the same question, depending upon the questioner's level of spiritual attainment and also in order to avoid dogmatism, since he encouraged his followers to test everything he taught. Missionary literature at the time depicted Buddhism as a pessimistic, negative religion because of its teaching about the non-existence of the 'self'. Other Western writers were convinced that Buddhists really did believe in a 'self'. The Buddha was commonly depicted as a divine being. Olcott's Catechism was robust and accurate in depicting the Buddha as human and in describing the Buddhist view of "personhood" as an amalgam of accidents  Olcott also gained a reputation as a healer, starting on 29 August 1882 when he used his mystical gifts to heal a paralyzed man. He became so popular as a healer that he was overwhelmed by requests, and after about a year declared that the "Masters" had asked him not to exercise this gift anymore. In 1884, following a clash between Catholics and Buddhists in Colombo, Olcott was sent to London to demand reparation, thus acting as a mediator between East and West. In London, he secured a guarantee of religious freedom for Buddhists and recognition of the Buddha's birthday from colonial officials. Olcott’s Buddhism both responded to the criticism of Christian missionaries and was consciously shaped by Protestant Christianity. For Olcott, there was no contradiction in being a Theosophist and a Buddhist, or a Theosophist and a Hindu since what he taught was perennial philosophy. Thus, while Theosophy did represent a primary identity, this did not preclude members from also identifying with other, equally all embracing, world views. On frequent return visits to the Theosophical Society's headquarters in India, Olcott helped to establish schools for Dalits (untouchables) and a Hindu Young Men's Association to mirror the Buddhist Young Men's Association. He also pioneered unity between different Buddhist communities. Traveling to Burma and to Japan he advocated the formation of a World Buddhist League. When the World Buddhist Fellowship was established in 1950, it adopted Olcott's flag as its emblem. In Olcott died in India on After his death, the leadership of the society devolved onto the shoulders of Blavatsky's protege Annie Besant. In 1890 having recovered her health, Blavatsky again involved herself in the Theosophy Society, establishing what she called an inner circle, of which Olcott was not a member. He did not approve of her renewed involvement, and following her death in 1891, he also became estranged from one of her confidantes, William Quan Judge (1851 – 1896) who was accused of forging messages from the Masters. In 1895, a schism, with Judge leading what became known simply as the Theosophical Society based in the USA, and Olcott and Annie Besant continuing to lead the Theosophical Society-Adyar. 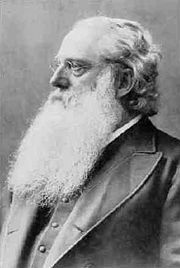 Olcott died in 1907 (February 17) while in India. He is still fondly remembered by many Sri Lankans and especially the students of these schools who have gone on to become Prime Ministers and industry leaders of the country. Olcott Road, a major street in Colombo, has been named after him. A statue of him has been built in Madras, India. Old diary leaves, Inside the occult, the true story of Madame H. P. Blavatsky. Philadelphia, PA: Running Press, 1975 (reprint) ISBN 0914294318. Dharmapala, Anagarika, and Ananda W. P. Guruge. Return to Righteousness, A Collection of Speeches, Essays, and Letters of the Anagarika Dharmapala. [Colombo? ]: Anagarika Dharmapala Birth Centenary Committee, Ministry of Education and Cultural Affairs, Ceylon, 1965. Motwani, Kewal. Colonel H. S. Olcott, a forgotten page in American history. Madras: Ganesh, 1955. Prothero, Stephen. 1995. Henry Steel Olcott and "Protestant Buddhism." Journal of the American Academy of Religion 63 (2): 281. Williams, Gertrude Marvin. Priestess of the Occult, Madame Blavatsky. NY: A. A. Knopf, 1946. History of "Henry Steel Olcott"
This page was last modified on 18 December 2017, at 17:03.